Again, this recipe is from Mom’s Kitchen, which makes sense because who is the only person in the world that can make you feel better when you’re sick? Mom. Now I was feeling pretty sickly/weak/lazy when I attempted this so that should tell you how easy it is to make. If you have some chicken broth, chicken breast and at least two veggies on hand, you are good to go. Oh, I should add that all of the recipes I post on here are for one – except cookies and the like. Cover chicken breast with chicken broth in a saucepan on high heat. Add onion, salt and pepper, and a few pieces of both celery and carrot for flavor. Bring to a rolling boil then reduce heat so chicken is still “rolling” a little and let simmer for an hour covered, but with a little room for steam to escape. Check occasionally to make sure heat is not too high etc. I may have accidentally boiled away all of the broth the first time I did this leaving me with no “soup”… Strain the broth into a separate bowl. 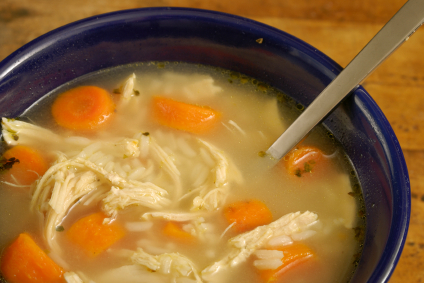 Tear up the chicken and add pieces to the broth bowl. Add peas and remaining carrot and celery to soup (and noodles if desired.) Serve!